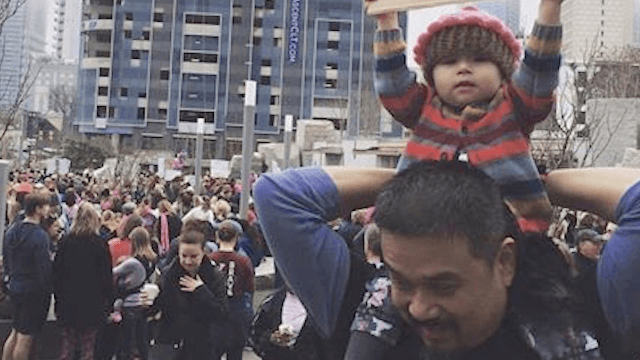 'Woke Baby' had the best sign at the Women's March. On Saturday, at least 3.3 million people, in over 500 U.S. cities (not to mention the rest of the world) gathered together to protest President Trump in Women's Marches, perhaps the largest demonstration in the history of United States, according to Vox. That's a hell of a lot of people, and a hell of a lot of signs, a great many of them funny, angry, and inspiring, or all three at once. But there's one sign that's really captured the feeling of the march, and it's this one from the Charlotte, North Carolina march, which has gone viral, with over 11,000 likes and 20,000 shares on Facebook. The adorable baby (who has now come to be known as "woke baby, meaning awake not as in "not asleep," but "aware") perched on her father's shoulders belongs to Lent's friend, Jenny Sowry, and her husband Sam (pictured). Jenny Sowry is the mom of two kids, a 9-year-old son and a 22-month-old daughter. Speaking to BuzzFeed News, Sowry explained that she was talking to her son, who'd recently seen Selma, about the march when he decided to make a sign reading "All people are equal." Much to Sowry's surprise, though, her little girl took it upon herself to make a sign of her own, reading…well, that's unclear. But what is lacks in language, it makes up for in feeling. It's the thought that counts, right? When I saw my friend’s daughter have the space to express herself and not have a statement forced upon her, I though that is exactly the sort of demonstration we need. Fresh, original, artistic. The word that keeps coming back to me is "hope." It makes people hopeful that there is already a little one who is already speaking her mind. . . I don’t always know what she’s saying, but she always speaks her mind.